An orange tree; note the dense, dark green foliage. The collective name 'citrus fruits' is given to the fruit of all the cultivated species of the genus Citrus. 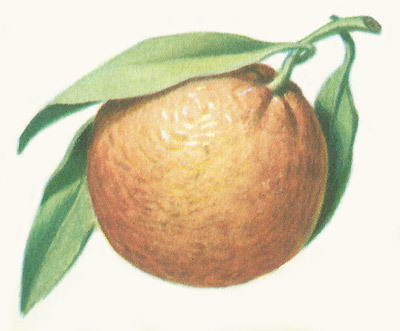 Besides the orange, the genus includes the lemon (Citrus limon), the lime (C. aurantifolia) the citron (C. medicus), the shaddock or pummelo (C. grandis) and the grapefruit (C. paradisi); the grapefruit is derived from the shaddock and is closely allied to it. 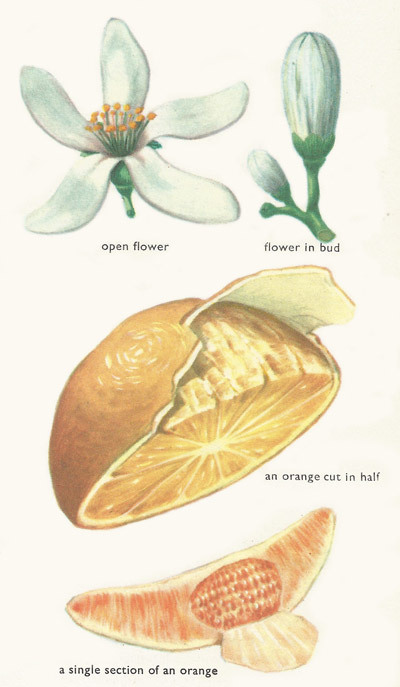 The orange is cultivated mainly for the sake of the fruit, but the fragrant white flowers yield perfume, whilst the orange tree itself is extremely ornamental. There is some doubt as to the true country of origin of the orange. The tree is found apparently wild in India, but these trees may be the result of ancient cultivation, and it is more likely that the orange came originally from south China. It was brought to western Asia by the Arabs before the ninth century AD and by the twelfth century was cultivated in eastern Mediterranean region. These early oranges were all the sour or Seville oranges (Citrus aurantium). The orange is the largest of all the citrus trees and may reach a height of over 30 feet. 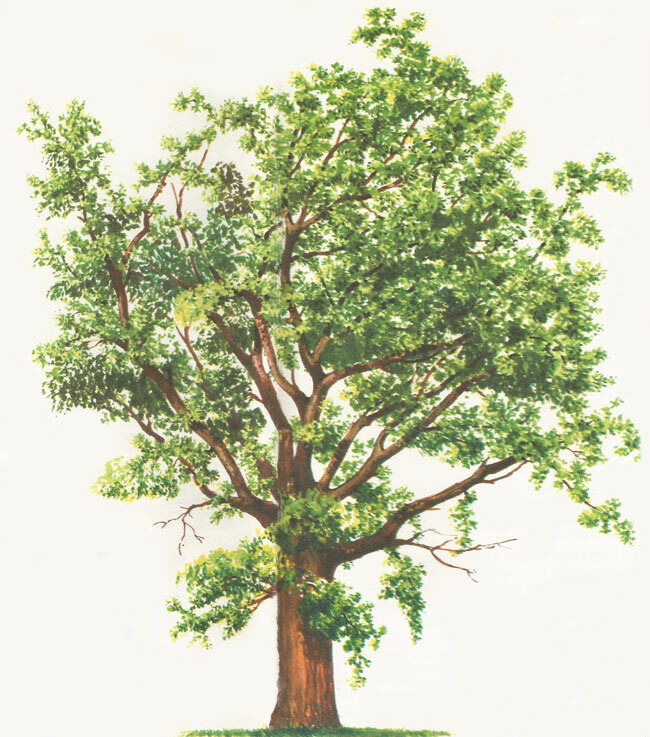 The trunk is straight and grayish in color, and the top of the tree is rounded with very, dark green foliage. The tree may live to 100 years, but in orchards it is replaced after 30 or 40 years; the best yield of fruits is at about 20 years old. It flourishes best in sub-tropical or warm-temperature regions where there is a cool season. In temperate regions oranges can be grown under glass, but a very large greenhouse is needed to accommodate a tree big enough to produce fruit. The leaves of the orange are alternate and finely serrated. They are rather tough and leathery and a deep, rich green above, paler below. The stalk or petiole of the leaf is usually flattened and expanded at each side. The orange blossom has a fleshy corolla, very fragrant, with five white petals. When the petals fall and the fruit begins to form, the sepals remain attached to it and persist in the form of a little green five-pointed star on the apex of the ripe orange. • The epicarp; this is the peel, orange or yellow in color and rather thick. It makes up about one-fifth of the weight of the fruit. • The mesocarp; this is the white spongy layer just inside the peel. • The endocarp; this is the tough transparent skin surrounding the ovaries or sections which make up the bulk of the orange. • The seeds or pips are surrounded and protected by numerous cells, like little bags, closely packed together and filled with sweet juice. Some varieties of oranges have been produced which are entirely without seeds. There are three main species of orange. The sour or Seville orange (Citrus aurantium) is the ancestral type; the sweet common orange (C. sinensis) and its varieties are the most important commercially; the mandarin orange or tangerine (C. reticulata) is a dessert fruit. The sour orange is used mainly to provide rootstocks for grafting other varieties. The fruit is acid-flavored but makes good marmalade. 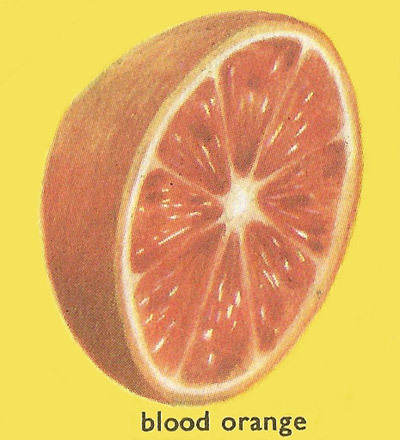 The sweet orange has many varieties, including the blood orange and the navel orange, so called because of the protuberance at its apex. Mandarins or tangerines are small oranges that are very sweet, with thin, loose peel, readily separated from the segments. Some varieties, such as the Satsuma, are entirely without seeds. Oranges are picked when fully ripe and do not continue to ripen afterwards. They must be carefully handled to prevent bruising. Oranges must not be stored at a low temperature; if they are suddenly chilled or frozen they quickly lose their flavor, so it is better not to put them in the refrigerator. About 46° F. is the temperature at which they should be stored; this is cool enough to prevent the growth of mould and not cold enough to damage the fruit. Most of the world's oranges are grown in the southern United States; other important producers are Spain, Italy, Brazil, Argentina, Paraguay, Mexico, Japan, Algeria, Egypt, and Israel. The annual world production is about 64 million tonnes. Most of these are sweet oranges and the greater part of them go to making concentrated juice, which is bottled for drinking. Mandarin oranges are also grown on a large scale as a dessert fruit and for canning. The production of Seville oranges is limited mainly to Spain, the fruit being exported in large quantities for making marmalade. In Southern Italy and Sicily a variety called the bergamot is grown for the sake of the oil which is contained in the peel. This is pressed out and used for flavoring and making perfume. What do we get from orange trees? The fruit is of course the most important product of the orange tree, but orange blossom is also used to make perfume and to flavor syrups and liqueurs. It contains essences called terpines. When examining the fruit, we must first consider the peel. This contains an essential oil, very strong-tasting and inflammable (dried orange peel burns very readily). This is used to make 'orange bitters' and the liqueurs called 'Curacao' and 'Triple Sec', which are produced in Holland and other countries as well. The bergamot orange is grown specially for the oil which is pressed out of the peel. The sweet pulp of the orange is delicious to eat or to drink in the form of concentrated juice. Oranges have a higher content of vitamin C than any other fruit or vegetable consumed by man in any quantity (in lemons it is a little higher still). They also contain sugars, citric acid, and other substances important in a healthy diet. Both the peel and the pulp are used to make the 'orange jam' which we call marmalade. Orange pulp contains over 8% of sugars and 0.65% of protein. Marmalade had 60 to 70% sugars, about 0.6% of protein and traces of essential oils.